The twenty fourth edition of Salon Son & Image (www.salonsonimage.com) took place at the end of March during an unexpectedly warm weekend in Montreal, Quebec. As last year, the event was held at the Hilton Bonaventure hotel in the heart of downtown Montreal. This annual event provides a fantastic opportunity for manufacturers, distributors, retailers and custom installers to showcase and demonstrate their latest products and connect with members of the industry and media. For consumers, the show offers an opportunity to listen to and see hundreds of products, all under one roof – it is truly an audio video enthusiasts dream. 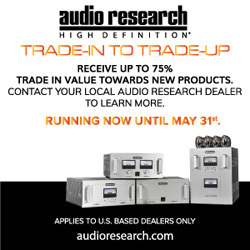 Thousands of CANADA HiFi readers attend this show and it’s always a pleasure to meet some of you on at the event. I am delighted to make the trip to Montreal every year and cover as much of the show as possible in these pages. As in the past, Phil Gold, our resident audio expert, joined me in covering the show. You can read his article “2011 Salon Son & Image – Phil Gold’s Perspective“in the Features section on novo.press/. You can also find a slightly extended version of this article in the same section. My exploration of the show began by visiting the Totem Acoustic room, the closest room to the CANADA HiFi display. 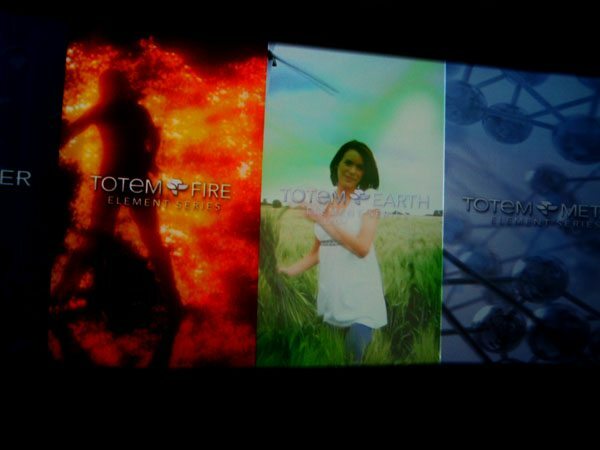 Totem always goes above and beyond what other exhibitors do to design the most visually attractive display. This year was no different and with a new twist. The focus of this year’s display was to introduce visitors to the new Element Series. Totem’s room was divided into two sections – one featuring a two-channel demonstration of the new speakers and the other featuring a gigantic, spectacular five panel projection wall. The screen, 32 feet wide by 12 feet tall, was fed by four LCD projectors from an upstairs balcony, and displayed graphic animations introducing the new speakers. The design of the visual presentation was nothing shy of exceptional and left most viewers staring at the screen in awe. At launch time, the new Element speaker range consisted of three new models: Element Fire (bookshelf, $5,995), Element Earth (column, passive radiator, $8,995) and Element Metal (column, twin woofers, $12,995). These will soon be followed by the Element Wood (centre channel) and the Element Water (subwoofer) for those who wish to build a multichannel system. The Element Series offers two major technological advances from Totem. 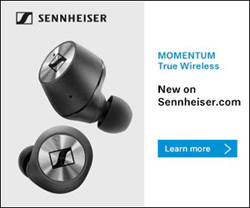 The first is the 7-inch Torrent hand-assembled driver, an evolution of the Torrent driver found in the company’s On-Wall speaker series, which utilizes a revolutionary magnetic field technology. The second advancement is that no crossover parts are used in the woofer section. 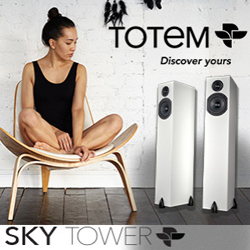 As we’ve come to expect from Totem, the new Element Series not only looks gorgeous, it offers a performance to match. 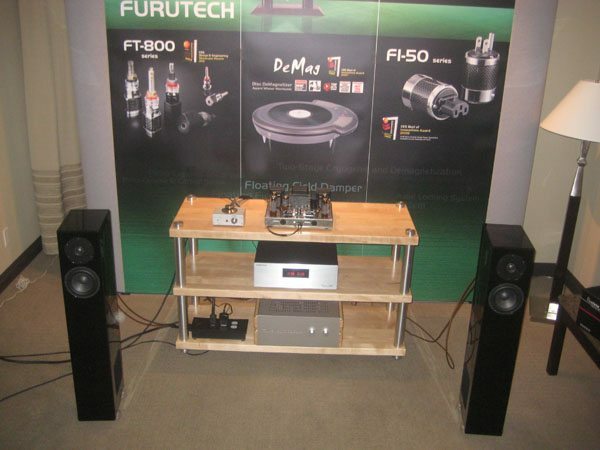 At the time I visited this room, the Element Fire bookshelf speakers were paired with a Classe Audio pre-amp and amps and the source was a Classe Audio CD player. 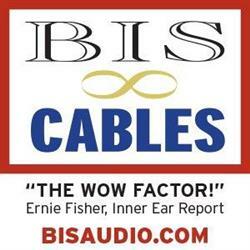 In a nearby room, Oracle Audio and Kimber Kable teamed up together to display their latest offerings. 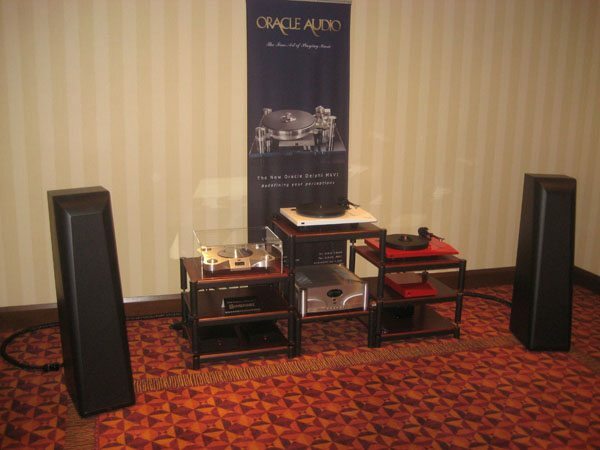 Canadian manufacturer Oracle Audio was showcasing its new, more affordable Paris range of products which at this time contains a turntable and a phono stage. The Paris turntable combines the same electronics and motor assembly as the company’s high-end turntable with a Pro-Ject Audio 9CC carbon fiber arm ($950) and a moving coil cartridge ($1150). The turntable itself retails for $3150. A complete Paris turntable can be purchased for $5000, a little less than the sum of its parts. The turntable’s chassis is constructed out of MDF and topped in a deluxe high glossy finish. Two different colours of the turntable were shown, finished in a white and a red. The Paris phono stage features a matching glossy finish and a matching integrated amp will join the Paris product line-up in the future. 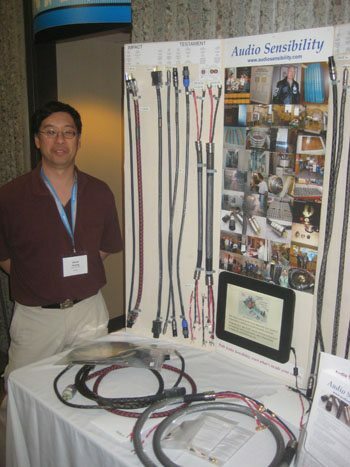 Kimber Kable showed its current product line-up displayed on a table which contained everything from its attractively priced, entry-level products all the way to the top. 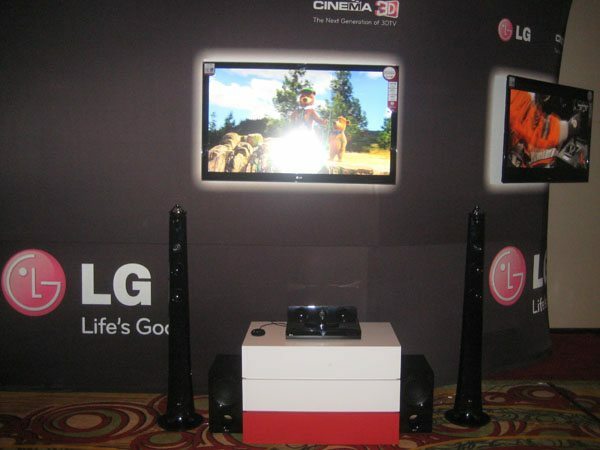 In another room close by, LG Electronics demonstrated its latest generation of 3D TVs, available in stores now, which use passive 3D glasses technology. This 3D technology uses very affordable passive, polarized (similar to anti-glare sunglasses) glasses that filter the image entering each eye. These glasses are virtually the same as the ones used in 3D movie theatres. There are two advantages that this 3D technology offers over active 3D systems (like those in most other 3D TVs): a flicker-free image which is much brighter and very inexpensive, light weight 3D glasses. There is however also a downside – the picture resolution is cut in half (540 lines, instead of 1080) in order to display a 3D picture. Although I’m not a fan of the reduced resolution, the demonstration was in fact quite impressive. The picture had just the right amount of three dimensionality, exhibited a great amount of detail, and was completely flicker-free. The vast majority of the 3D material demonstrated was incredibly clean and virtually completely free of image crosstalk. This however was depended on the quality of the 3D material itself as one of the TVs did display noticeable image crosstalk. All the TVs shown were backlit LED (LCD) TVs – there are currently no plans to incorporate this 3D tech into plasma TVs (at least based on what the LG reps told us). 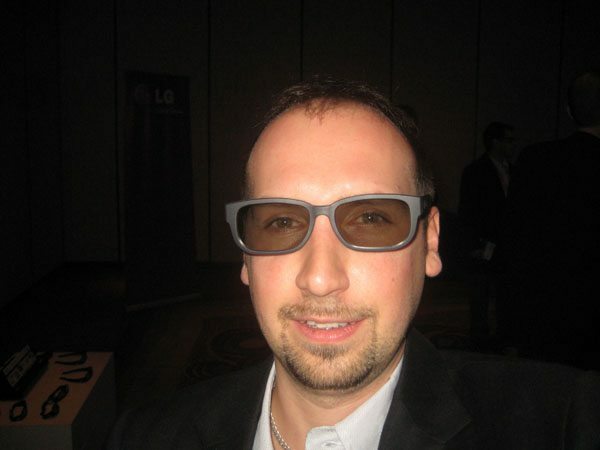 I found the passive 3D glasses to be much more comfortable to wear compared to my Samsung 3D active glasses. The only thing that I was left wondering was – how does the lenticular screen filter on the TV affect the quality of the 2D picture? Perhaps a review in our test lab is in order. 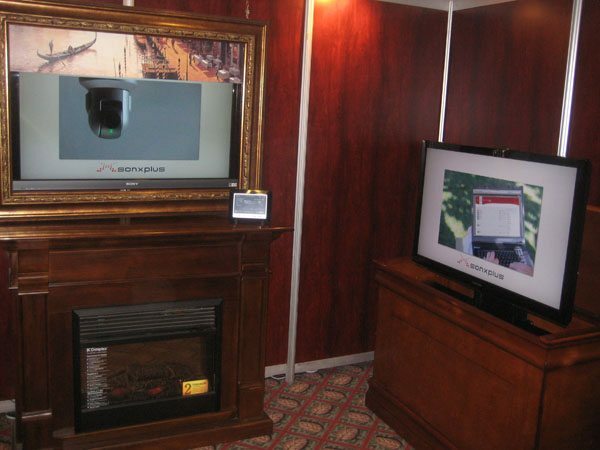 Plurison, one of Canada’s premier importers of audio video brands from around the world, had several small and large rooms spread throughout the hotel this year. 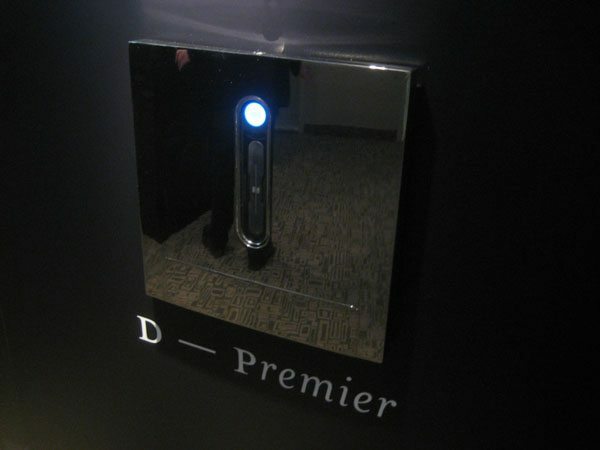 In the first room, Plurison introduced a new high-end brand to the Canadian market called Devialet from Paris, France. Devialet itself is actually a very young brand and has recently launched its first product – the D-Premier integrated amplifier ($16,500) aimed at those looking for the highest audio performance and minimalist, designer styling. 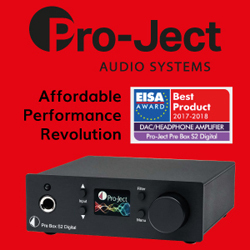 The D-Premier features a very special, proprietary amplifier design (2 x 240 watts) which is said to offer the benefits of both analogue and digital amplifier designs, at the very highest level of performance. Something else that makes this integrated amp unlike any other amp is its incredible versatility –its inputs and outputs, speaker impedance, phono inputs can all be configured on the Internet and the settings can then be uploaded to the amp using an SD card. Now that’s what I call flexibility! I would have been curious to listen to this amp but this room had a static display of the amps only. 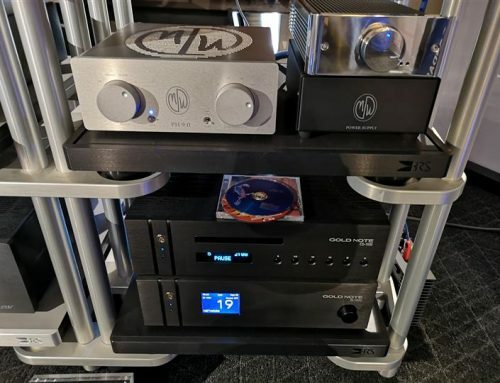 In the adjoining room, Plurison was demonstrating the new Micromega AS-400 integrated amplifier ($4500) connected to a pair of Focal Scala Utopia speakers. 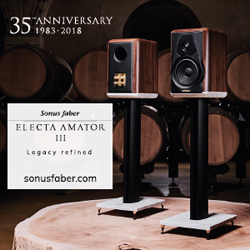 I have long been a fan of the Focal sound and own a pair of the Electra 1008 Be 2 speakers myself, so the outstanding performance of the Scala Utopias was not a surprise to me. 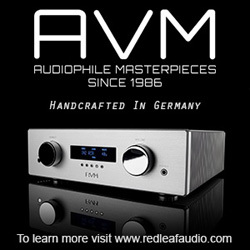 What did surprise me pleasantly however was the excellent sound of the AS-400 integrated amplifier. The soundstage had a detailed, pin-point accuracy with the sound reaching far beyond the walls of the room. Voices were crystal clean and the background was completely silent. Something that makes this amplifier very special is its AirPlay feature which allows iPods, iPhones and iPads to stream music wirelessly to it. 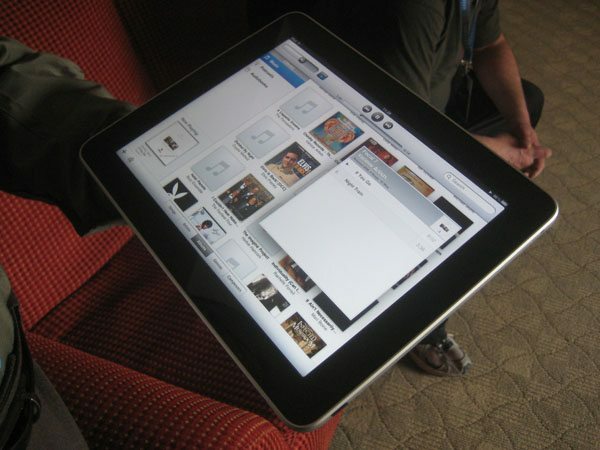 In fact, the presenter in the room was using an iPad to select and beam music to the AS-400. I just picked up the iPad 2 myself recently and would love to see how music playback integrates between it and an amp like the AS-400. 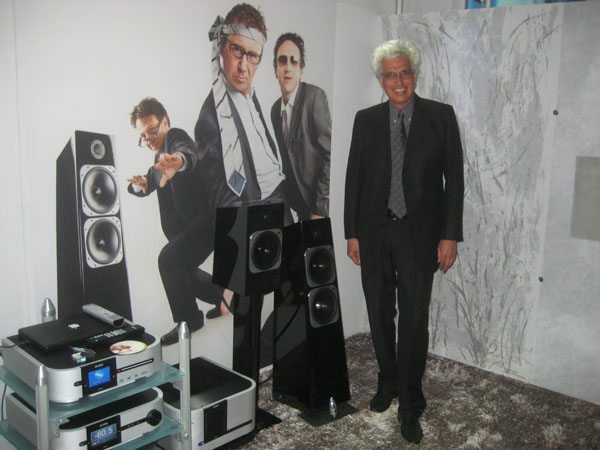 Next, my journey led me to a couple of other Plurison rooms which focused on the high-end British brand Naim Audio. The first room contained a static display of the newly introduced FraimLite equipment support system (AV rack), as well as the UnitiQute (all in one player), UnitiServe (music server) and the NaimUniti (all in one player). The second room offered a music system which consisted of numerous Naim components – at the time I walked in the presenters were using the new NDX Network Player as the music source, connected to the new Ovator S-400 loudspeakers ($7000). The NDX streamed music from a NAS (Network Attached Storage) drive located at the back of the room. The duo produced a highly detailed sound, with excellent imaging and ample bass energy. The S-400 speaker utilizes the same technology implemented in its larger S-600 brother but comes in a smaller package, at a more attractive price point. 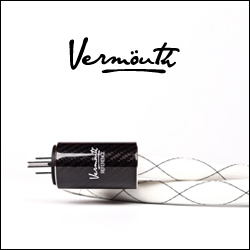 Nordost used this year’s Salon Son & Image to introduce its recently launched Leif Universal Cable System for the first time to the Canadian market. Now, you may think that a room full of cable products wouldn’t be the most interesting place to visit but you would be wrong. 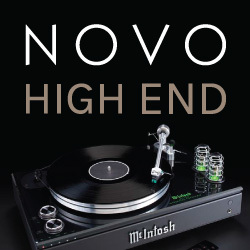 Nordost is one company that truly understands the power of a proper demonstration and how to engage its audience in an entertaining way. During the show the company was running great presentations showing how its cable and accessory products can improve a music system’s performance. 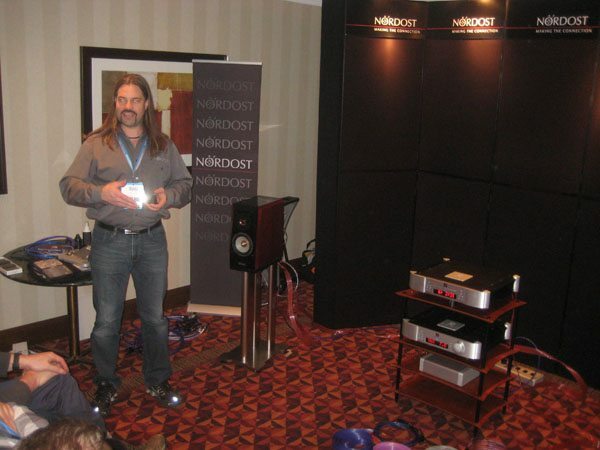 I sat through two presentations – one on Sort Kone resonance control devices and one on a product from Quantum Resonant Technology, Nordost’s sister company. The presenter first explained what the device is designed to do, then played a music clip without the device in the system and then with it in the system. I have to admit that I was pleasantly surprised at just how drastically the sound improved with Sort Kones (ranging from $80 to $450 each, depending on the model) in place. These devices, placed under noisy parts of a component such as the power supply, disc mechanism or a phono stage resulted in a very noticeable improvement: all background noise was virtually eliminated, the vocals had significantly less sibilance, there was a greater extraction of detail and the stereo separation was increased. A similar presentation of the Quantum QX4 device demonstrated that it can also significantly improve a system’s sound. 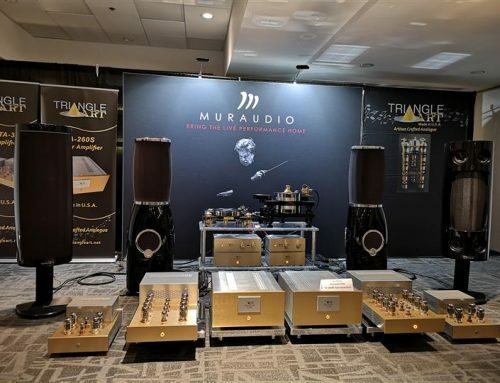 As we’ve come to expect from Audiyo at previous shows, the company was displaying a plethora of high-end audio accessories from Furutech, among other brands, including cables, connectors, accessories and DIY parts. 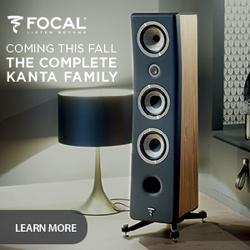 Their audio presentation focused on the recently introduced Alpha Design Labs GT40 USB DAC which features a phono stage, connected to a pair of Canadian made Klaro speakers. The GT40 is aimed at those with music collections on their computers who wish to improve the playback quality of their digital music. 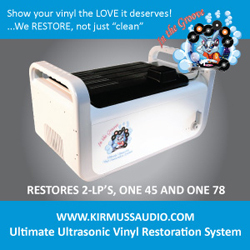 Thanks to its phono stage it can perform high quality transfers from vinyl to a digital format. And it doesn’t end there – the GT40 also offers a high quality headphone section which offers excellent performance. The GT40 does an exceptional job at recording vinyl to a digital format – the sound was incredibly clean and I wouldn’t be surprised if many were fooled to think that they are listening to a record when playing back the digital file (vinyl crackle is retained for authenticity). During the second day of the show, my exploration led me to visit to the MBL room. This is the very first time that MBL has been shown to the Canadian market by North American distributor MBL North America. MBL is a luxurious German brand whose entire product line-up is designed by Juergen Reis, the chief of engineering, who is also a recording engineer and musician. MBL’s product line-up offers a selection of models ranging from a reasonable $12,000 speaker all the way up to a $260,000 speaker for those who have gold bricks in their pockets. As soon as I entered the room, I knew that I was in for a treat. Not only did MBL have some of the most distinctive looking speakers at the show, they also produced a sound unlike any other. 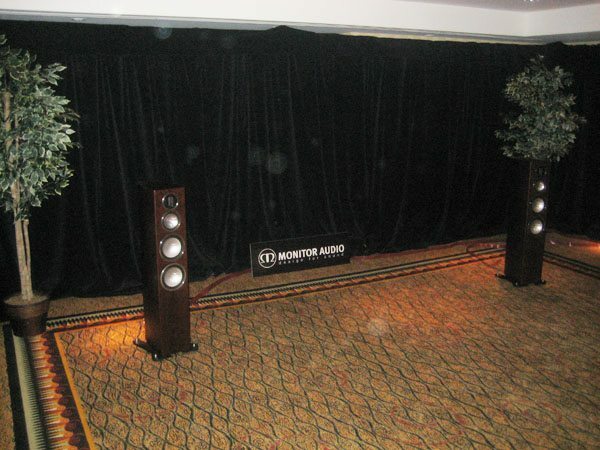 The audio setup in the room consisted of the newly introduced MBL 120 speakers ($21,000), MBL 9011 monoblocs ($100,000 for the pair) and the Reference line of electronics. What gives all of the MBL speakers such a unique appearance are the company’s omni-directional midrange and tweeter designs. Here’s how they work – petals of material are fixed around the voice coil at the bottom and fixed to a bearing at the top. The voice coil fires vertically forcing the petals to bend all the way around, in phase at the same time, which results in a true omni-directional pulsating sphere. The sound from this system was simply remarkable – when listening to a live Alanis Morissette track, it reproduced a truly realistic ambiance of the venue where the track was originally recorded, bringing forth all of the finest musical details and subtleties. I would have been perfectly content on listening to this system for a few hours. MBL will be introducing a new entry-level Corona line, which will offer a lot of trickledown technology for the company’s higher end products combined with new technology, at much more achievable price points. 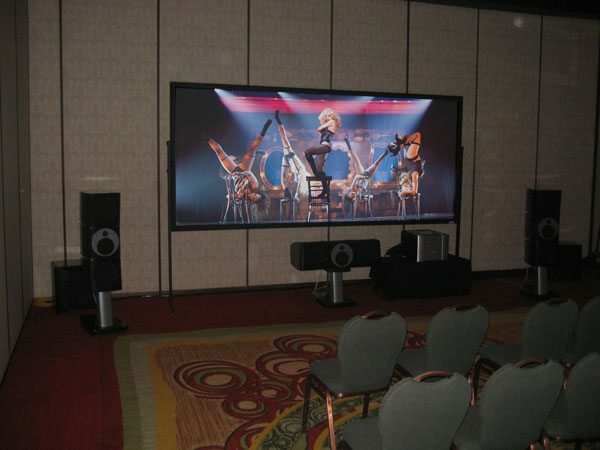 We spoke with the North American distributor and with any luck you should be able to see the Corona line on display at the 2011 Toronto Audio Video Entertainment Show (TAVES) this September. I’ve listened to some really great audio in the Audio Physic room at past shows and that’s not a surprise as the speakers demonstrated in the past were the company’s higher end models. This year, Canadian distributor Goerner Communication (who now also distributes Trigon) focused its efforts on presenting that excellent sound can be achieved at a much more reasonable price point. 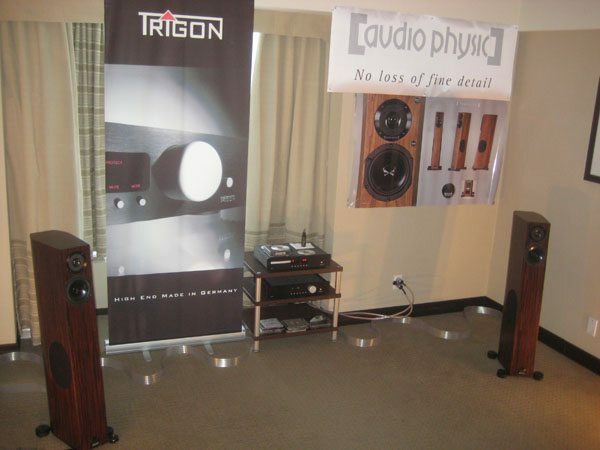 The setup in this room consisted of the Audio Physic Tempo 25 loudspeakers ($6500), the Trigon Energy integrated amplifier ($5000) and the Trigon CD II disc player ($4500). The total price of the system came to $16,000. The Tempo 25 is a special edition of the Tempo speaker, which celebrates the company’s 25th anniversary. The Tempo 25 utilizes the HHCM midrange driver and a HHCT II tweeter borrowed from the Cardeas flagship speaker. The internal structure of the cabinet has also been modified. I found that there was a great synergy between the Audio Physic speakers and the Trigon components, both which are designed and manufactured in Germany. The vocals were crystal clear and emanated from various locations of the soundstage, which had tremendous width and depth. During one of the musical selections the system produced a truly three dimensional sound field, with sounds coming from all around me. Overall, I thought that the system produced a very engaging presentation. Something else that might be attractive to potential customers is the fact that the Tempo 25 speakers and the components don’t take up a lot of room, hence this complete system would easily fit in smaller rooms. Canadian distributor Kevro International used this year’s Salon Son & Image to launch the new Monitor Audio Gold GX Series speakers and showcased many other Monitor Audio models, including in-wall speakers. The Gold GX series draws on some of the technology found in the high-end Platinum series. Highlights of the new series include a ribbon tweeter, which offers a similar performance to the one used in the Platinum series, new Monitor Audio C-CAM drivers and a redesign of the cabinets. Pricing of the Gold GX series starts at $2000 for a pair of bookshelf models and goes up to $6000 for a pair of the flagship floorstanding model. Two centre channel speakers and a subwoofer complete the series, for those who wish to build a multi-channel system. 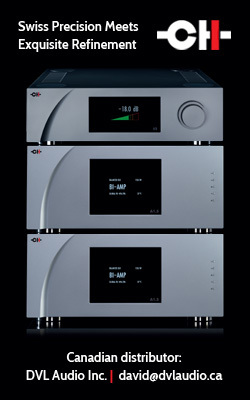 The audio presentation in the Kevro room featured the GX 300 speakers connected to Sim Audio’s 700 integrated amplifier ($12,000) and the 650 CD player ($8000). These speakers by no means require such high-end electronics to strut their stuff but the powerful amplifier was a wise choice given how large this room was. The GX 300’s offered an expansive soundstage with pinpoint accuracy, excellent stereo imaging and dynamics. The highs were exceptionally detailed thanks to the ribbon tweeters and vocals sounded very natural. 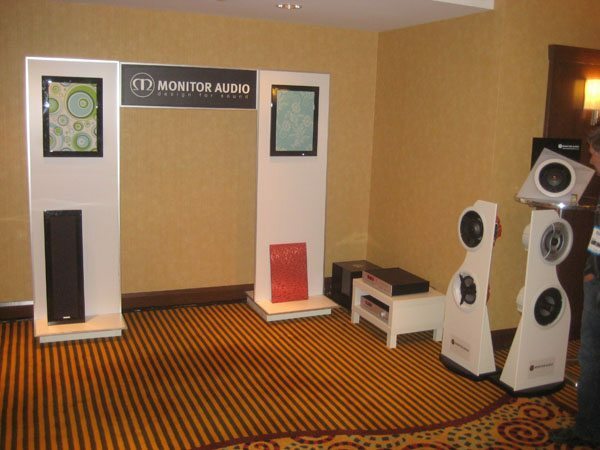 Outside of the room, a display was constructed to show Monitor Audio’s SoundFrame in-wall speakers. This in-wall series of speakers consists of two models, the SF 1 and SF 2, and features closed-cabinet designs, a high gloss frame (in your choice of black or white) and a choice of 12 different graphic grilles. Monitor Audio will also be glad to produce custom grilles if you provide them with the art. I listened to these speakers for a brief moment but it was difficult to judge its performance given the noise in the hallway. One of the more exciting things about a show like Salon Son & Image is that you never really know what you might stumble upon. It is very entertaining to see demonstrations of très expensive audio and video systems but at the end of the day most of us just don’t have enough in our wallets to buy this kind of gear on the spot at the show. The good news is that there are tons of smaller ticket items that you can purchase at the show such as records, CDs, Blu-ray discs, cables and various accessories, including DIY audio video parts. An interesting product/tweak that I came by this year is made by Toronto-based Audio Sensibility, an audio video cable maker. The product is called a grounding device and is said to expand an existing audio system’s soundstage and present better low level detail. It was available at the show for $35 and can now be purchased on the company’s website at www.audiosensibility.com. The device comes in two different versions, one designed to connect to loudspeakers and one designed to connect to audio components. Steven Huang, the owner of Audio Sensibility, provided me with the speaker version to try at home after the show. The grounding device is a pair of short cables designed to connect to the negative posts on the speakers, terminated with a spade connector on one end and a rubber cap on the other end. I will post a mini-review of the device on our website once I’ve had a chance to try it out. And just when I thought that the show couldn’t get any better, I walked into the very large room occupied by Sonxplus, a Montreal-based audio video retailer/custom installer chain. The focus of its display was to introduce visitors to the realm of home automation and just how affordable and easy to install these products have become. Sonxplus designed a display unlike any other that I’ve ever seen at a show – the large space was divided up into five zones. The first zone was a home theatre featuring a Sharp 3D projector and a 7.1-channel KEF speaker system. In the same room, there was an AV rack which contained all of the AV components and the brain of the home automation system, the Control4 controller (or central hub). The second room showed three different video zones (meant to represent the living room, dining room and a bedroom). Here, the idea was to show that thanks to a whole home system you could send a different video source to each TV or the same source to all three. The same room also displayed a number of home security cameras and keypads, all of which can be accessed from any TV in the house. The third room demonstrated a multi-room audio system which can access various audio sources such as digital music on the home network (or Network Attached Storage) or a central CD player. For enhanced browsing of your music library, the songs can be selected through an attractive graphic interface on any TV in the house, the Control4 keypads or iPhones/iPods/iPads. The fourth room presented a couple of high tech solutions that can conceal a TV when not in use – one was behind a picture frame where the painting canvas rolls down in front of the TV with the push of a button on a remote, the other was a wooden cabinet with a motorized cradle which slides the TV down into the cabinet with a single button. The focus of the final room was to demonstrate the various options for lighting, climate and window drapery/blind controls. All of these keypads are available in both wired and wireless versions. Although we didn’t get into a detailed discussion about the pricing of the various components, the salesperson did tell me that the Control4 controllers start at about $1000, while the wireless keypads go for about $160 each. I would imagine that these price points should make home automation pretty attractive to many audio video enthusiasts. There is no shortage of wonderful products to see at the show every year, albeit many of them costing a pretty penny. However there is one Canadian company that prides itself on catering to those with a modest budget who would like to enjoy high quality audio. That company is Grant Fidelity. In addition to manufacturing products under the Grant Fidelity name, the company also distributes numerous Chinese brands including Shengya, Jungson, Consonance and Shuguang. Its large showroom at Salon Son & Image featured loads of solid state and tube based components, in addition to a number of speaker models. 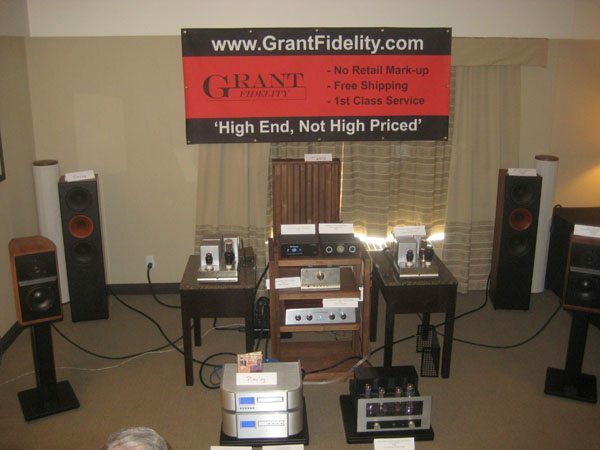 The star of the show in this room was the recently introduced Grant Fidelity W-30GT integrated tube amplifier with a built-in phono stage ($2500). The W-30GT will be glad to accept all analogue and digital sources, offers a highly tweak-able, modular design and promises to deliver performance that will rival many higher priced amps. Yes, the W-30GT did in fact pump out great sound for a reasonably priced amp, although I couldn’t do an in-depth listening test because there were too many conversations taking place in the room. Another component on demonstration in this room was a wireless DAC from Consonance, which is capable of playing 96kbps/24-bit files streamed from a USB transmitter that’s connected to any computer in the house. Rachel of Grant Fidelity pointed out that this DAC can be used to create a multi-room audio system without having to run any wires between rooms. 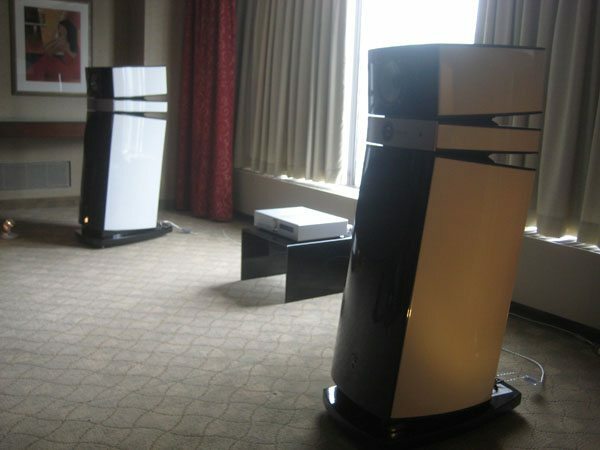 Visitors of the room were offered a chance to listen to the system through Grant Fidelity RBS-1 bookshelf speakers ($2,200) or Shengya V518 floorstanders ($2,800). Other gear that stood out in this room were Jungson’s new Hedo series components, which offer styling that looks conspicuously similar to my Class Audio components. The Hedo is Junson’s new entry-level series and as you’d expect these components don’t cost anywhere near what Classe components retail for (each component is priced under $1600). 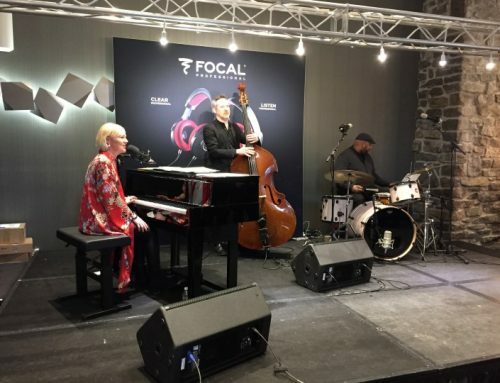 Another very interesting company which I came across at this year’s show was Montreal-based Fidelio Musique Inc., a unique, new generation recording company which specializes in classical and jazz music and embraces digital technology like no other. Its goal is to record music as accurately as possible by employing an experienced team of audio specialists and top notch recording equipment. All of Fidelio’s recordings are available on CDs and credit card-sized USB flash drives (96 kHz/24-bit or 176 kHz/24-bit). Some are also available on master CDRs (high quality compact discs) and high quality vinyl. The proof of how this company embraces the latest technology is of course in the flash cards. The flash cards contain the album in the WAVE format and also include album cover art, an information booklet, a XML file with all track names, an ISRC code and the Fidelio catalogue in PDF format. The idea behind the flash cards is to provide music that has not been altered by any moving part, from the original recording session to your audio system. Fidelio records all sessions on a SSD drive and later, uploads the unadulterated master directly to the flash card. The cards are designed to connect to a computer or digital music server for playback at home. The end result is nothing shy of remarkable. I listened to a couple Fidelio tracks in different rooms at Salon Son & Image – and I swear that these were some of the highest fidelity recordings I’ve ever heard. You can browse Fidelio’s music catalogue online at www.fideliomusique.com. In another room, audio component maker Raysonic, its products designed in Canada and manufactured in China, showed just how far its products have evolved since the company’s inception. 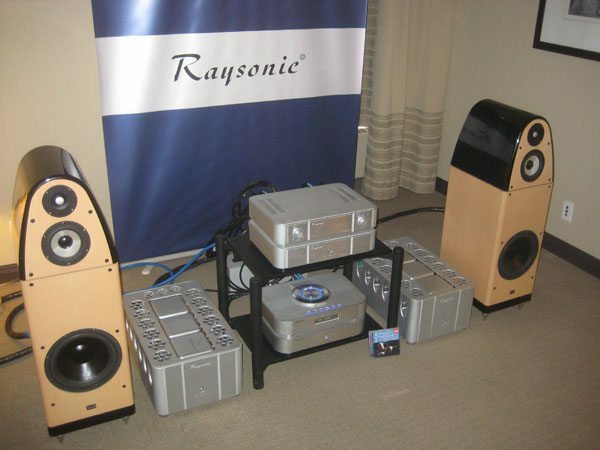 The audio setup in this room consisted of Raysonic Reference 26 tube monoblock power amps ($16,500), the Reference 2 tube preamp ($17,000), the CD 228 tube CD player ($4200) and Revolver Cygnis speakers ($17,000). I’ve always very much enjoyed Raysonic’s design aesthetics – most components are housed in brushed aluminium chassis with neatly rounded corners, and I appreciate the additional design cues found in the Reference series. 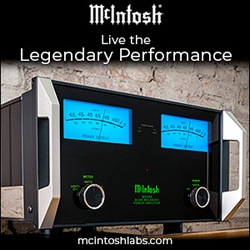 I’ve listened to a number of Raysonic components in the past, I even owned one of its integrated amps, and can say with confidence that the performance of its components has matured significantly. While listening to some classical music, I found the system in this room to deliver an engaging, emotionally stimulating performance. The sound was warm, dynamic and detailed and the soundstage was grandiose in both width and depth. 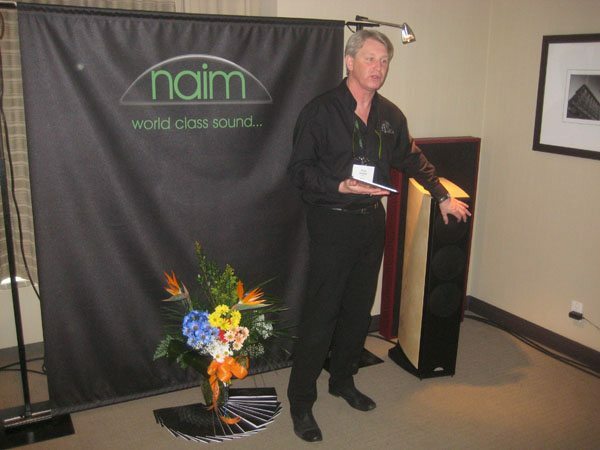 As mentioned above, Plurison – the North American distributor of many fine brands such as Cambridge Audio, Focal, Micromega, Naim, Rega, Martin Logan – had several different demonstration rooms at the show which I visited earlier during my show exploration. I didn’t visit Plurison’s last room until the last day of the show because a part of me was hoping to save the best for last. 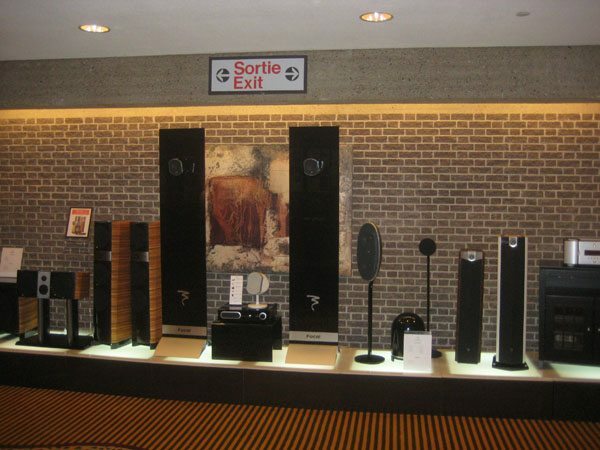 As in previous years, Plurison’s largest room focused on showcasing the Focal speaker brand from France. 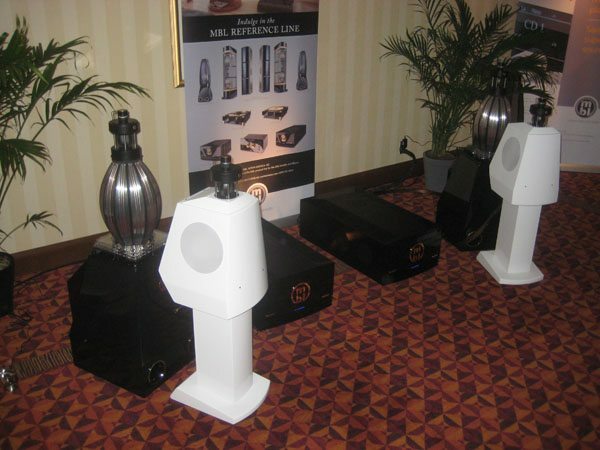 On demonstration this time around were the Viva Utopia speakers, the latest addition to the Utopia III speaker range. The Viva Utopia ($25,000/pair) is a sophisticated three-way, audiophile speaker designed for multi-channel sound systems, although it will be just as glad to play in a stereo system. The speaker is available in both vertical and horizontal (centre channel) configurations and should be placed on a short speaker stand. The speakers were connected to Sim Audio’s electronics and various video sources were used to allow quick switching between sources. 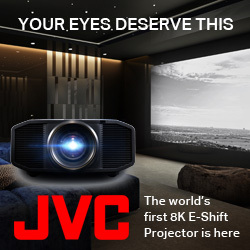 The visuals were provided by a JVC D-ILA projector with an anamorphic lens, projecting onto a gigantic screen. When I walked into the room, the presentation consisted of clips from Inception and Burlesque on Blu-ray. The action clip from Inception contained a mishmash of sound effects including a train ripping through the pavement, heavy rain, gun shots and screaming car engines – all accompanied by the backdrop of the soundtrack. The Viva Utopias had no problems sorting through the layers of sound. Each effect was reproduced with the outmost clarity and realism and existed in its own space, and it all amounted to a thrilling presentation. This is exactly what being thrown into the middle of the action should feel like! The sound had amazing detail, played with incredible dynamics and phenomenal bass. 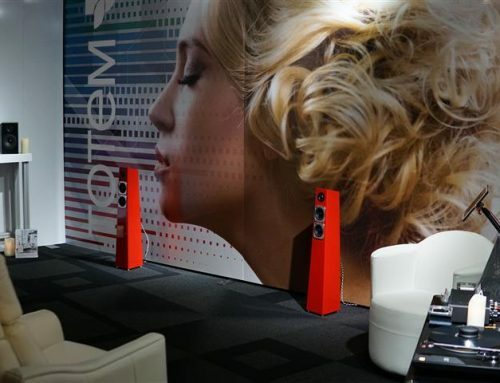 The musical clip from Burlesque demonstrated that the Viva Utopia speakers were capable of world class audio performance in a multi-channel system. They created a truly three dimensional soundstage and a hyper realistic environment of the original performance. The presentation left a smile on my face that lasted at least a couple of days. 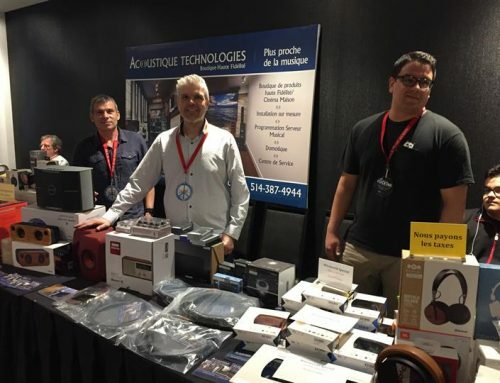 I hope that you enjoyed my coverage of this year’s Salon Son & Image and hope to see you at the Toronto Audio Video Entertainment Show (TAVES) this September in Toronto. For more details, please visit www.taveshow.com. Come back to the CANADA HiFi website in a few days to read our full coverage of this year’s Salon Son & Image event.